Use Review Reminder extension to get more product reviews from customers or Import Export Product Review to import and export reviews via a CSV file. Magento 2 Review Extension enhances your store default review with extended features for buyers. Customers now can add specific pros and cons to their opinions about the items. They are freely to choose among the list of pros and cons from previous buyers or to create new ones themselves. Such a great idea to hear more feedbacks about your product. The general rating only is not enough. What if they are happy with your price but not satisfied with your service? Don’t worry as you can set up explicit custom rating value with Magento 2 Review Extension. List out the most important factors of customer satisfaction after purchase. Then you can configure to get the rating for each factors at backend. 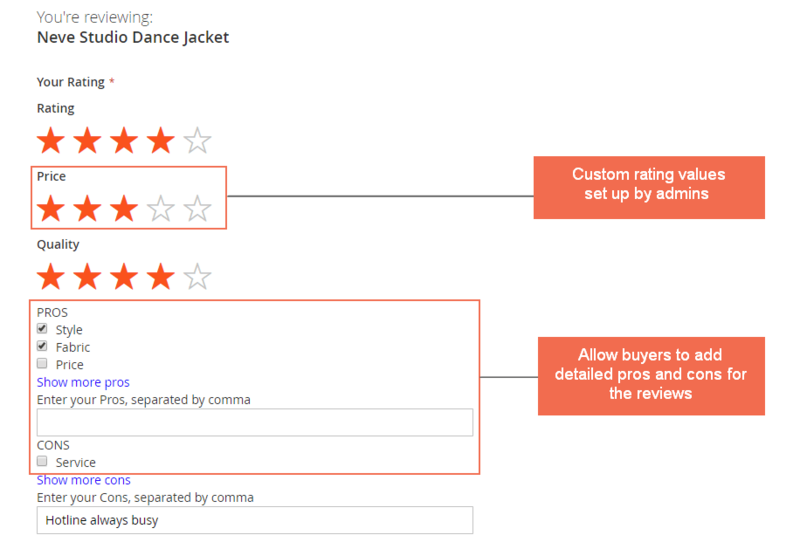 This feature allows buyers to easily sort out product reviews in Magento 2. No more getting lost in tons of reviews. 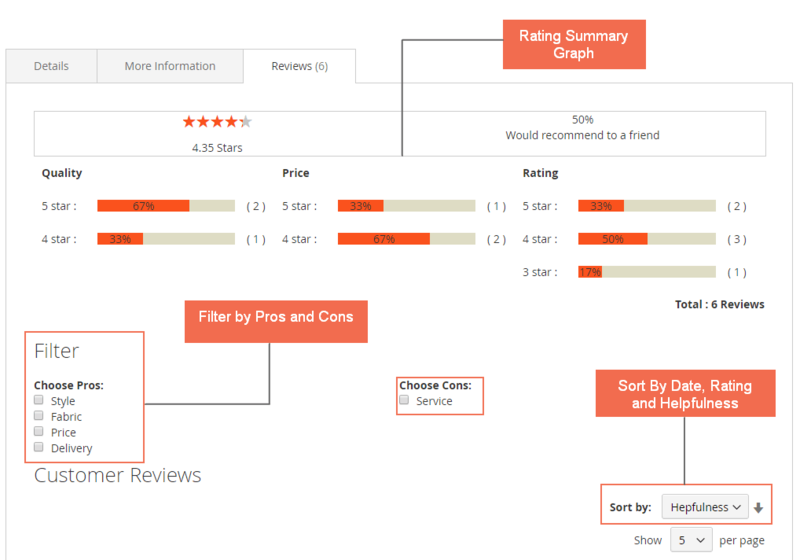 Customers can filter by either pros or cons and the result can be sorted by rating, date, helpfulness with pagination. There’re tons of customers who just silently read the product review but don’t have time to leave one. That’s why we develop the voting for helpful/unhelpful function for Magento 2 Review Extension to increase the interaction from visitors. Besides, sharing favorite feedback via social networks is also enabled. Even if reviews need to be approved by admins before published, the chance of spam is still very high. Reports from visitors help you to get rid of the spam and fraud reviews completely. At backend, admins can limit the access to review section. You are freely to choose who can write feedbacks for the products among all, logged-in customers or only who buys the item. By this feature, store owners can control the quality and trustworthiness of the review in Magento 2. With the upgrade features, Magento 2 Review Extension enhances your customer experience at the product page. Each item is now powered with a trustful and detailed review and rating system, which will definitely raise the conversion rate. I install your Magento 2 Advanced Review extension after reading your post about Magento 2 social proof, all features are working very well. Thanks. Thumbs up for dedicated support. I've shopped on your sites several times and all orders live up my expectation. For Magento 2 Advanced Review extension, there was something wrong at first as it didn't work smoothly on my stores. I contacted your CS team, and they response quickly with useful solutions. Everything is fine now. Thanks. NIce experience with your Magento 2 Advanced Review. This is exactly what I look for to leverage social proof on sites. Every feature works well as your promised. Great! With Magento 2 Advanced Reviews extension, I can easily collect more detailed reviews from customers to improve my services and products, as well as promote other visitors to place orders. This module is worth being installed on site at a reasonable price.